A king of Mesopotamia, or, more specifically, of Aram-naharaim ("Aram of the two rivers"), probably a kingdom in northern Mesopotamia (see Aram). He was the first of the oppressors of Israel in the time of the judges. 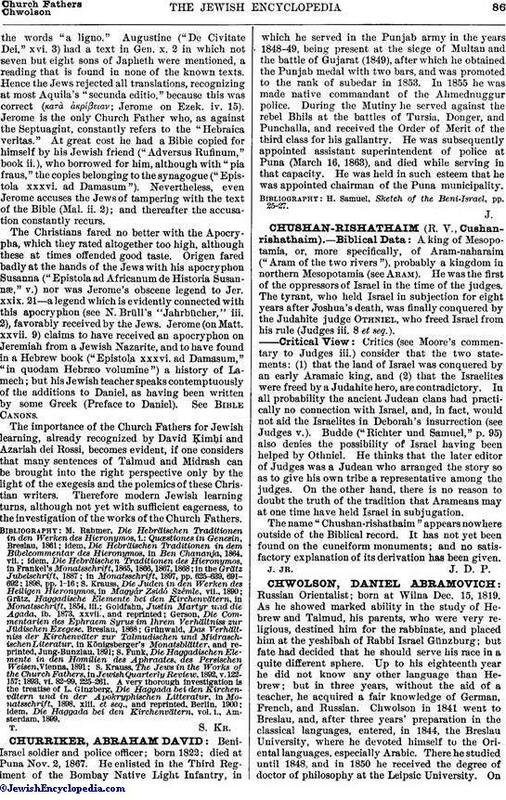 The tyrant, who held Israel in subjection for eight years after Joshua's death, was finally conquered by the Judahite judge Othniel, who freed Israel from his rule (Judges iii. 8 et seq.). Critics (see Moore's commentary to Judges iii.) consider that the two statements: (1) that the land of Israel was conquered by an early Aramaic king, and (2) that the Israelites were freed by a Judahite hero, are contradictory. In all probability the ancient Judean clans had practically no connection with Israel, and, in fact, would not aid the Israelites in Deborah's insurrection (see Judges v.). Budde ("Richter und Samuel," p. 95) also denies the possibility of Israel having been helped by Othniel. He thinks that the later editor of Judges was a Judean who arranged the story so as to give his own tribe a representative among the judges. On the other hand, there is no reason to doubt the truth of the tradition that Arameans may at one time have held Israel in subjugation. The name "Chushan-rishathaim" appears nowhere outside of the Biblical record. It has not yet been found on the cuneiform monuments; and no satisfactory explanation of its derivation has been given.